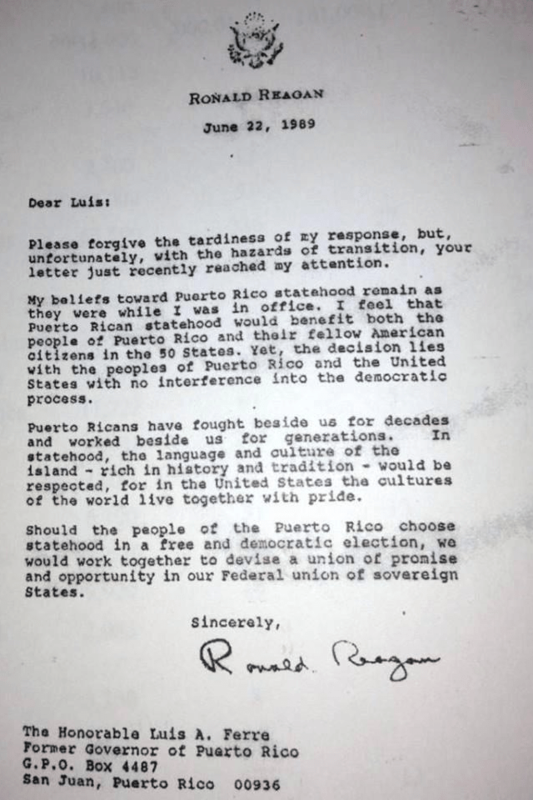 In 1989, former President Ronald Reagan sent a letter to former Governor of Puerto Rico Luis Ferre. Please forgive the tardiness of my response, but, unfortunately, with the hazards of transition, your letter just recently reached my attention. My beliefs toward Puerto Rico statehood remain as they were while I was in office. I feel that Puerto Rican statehood would benefit both the people of Puerto Rico and their fellow American citizens in the 50 states. Yet the decision lies with the people of Puerto Rico and the United States with no interference into the democratic process. Puerto Ricans have fought beside us for decades and worked beside us for generations. In statehood, the language and culture of the island — rich in tradition and history — would be respected, for in the United States the cultures of the world live together with pride. Should the people of Puerto Rico choose statehood in a free and democratic election, we would work together to devise a union of promise and opportunity in our Federal union of sovereign States. The letter is consistent with previous statements made by Reagan. In one televised address, the former president confidently predicted that “The United States will welcome [Puerto Rico] with open arms.” Even as a candidate, the future president did not shy away from encouraging Puerto Rico statehood. The former President is not alone — numerous United States presidents and other high ranking U.S. officials have recognized that Puerto Rico equality is an issue that impacts all Americans. Read some of their statements here.